At this point in the game, it seems highly unlikely that the famed Mazda rotary will return as a standalone engine. Sorry about that. But as a range-extender in a new electric car? Maybe! The Wankel engine will apparently appear in Mazda’s new fully electric car as a range extender in 2019, Martijn ten Brink, Mazda Europe’s VP of sales and customer service, told Dutch publication, ZERauto.nl. The new electric car will be built on the Mazda2, Mazda3 and CX-3 platform. The rotary engine (range extender) has no turbo and is a single rotor engine. It functions purely as a generator. It is placed flat and is as big as a shoebox. With some peripheral issues such as cooling, you talk about the size of two shoe boxes, still very compact. The wankel motor is vibration-free. The buyer will therefore not notice anything if the range extender starts when the battery pack runs out. 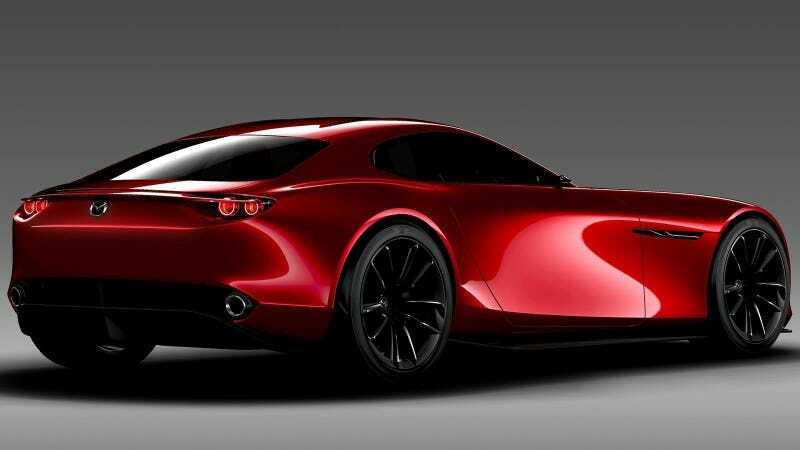 Our hope for the return of the rotary engine was renewed in October of 2015, when Mazda showed us the RX-Vision Concept. It was a sleek and beautiful thing. They didn’t tell us what powered it, but they did use the words “SkyActiv-R rotary” and the RX moniker for Mazda traditionally means rotary. Then there were rumors of a turbo-rotary, a luxury rotary and, most recently, lasers. All of those things seemed to be ideas and hopes from Mazda, though. This new statement from Brink sounds the most likely. There’s no way that a traditional rotary engine, inefficient and finicky as all hell, will be able to adhere to the emissions standards of today. But as a range extender for an electric vehicle... that’s definitely plausible. Jalopnik reached out to Mazda for comment, and a Mazda spokesperson responded that Mazda’s North American operations could not comment on the statements from a European executive, but did send along this chart that outlines a plan for EVs in the coming years.